This is another site that preserves and remembers the ruins of villages abandoned around AD 1300. Prehistoric Pueblo peoples built these structures and occupied them for only 50 years before they were abandoned. Farmers used the scant rainfall to grow crops, build houses, and raise families. But these were nomadic people, and after a period of time, they moved on. 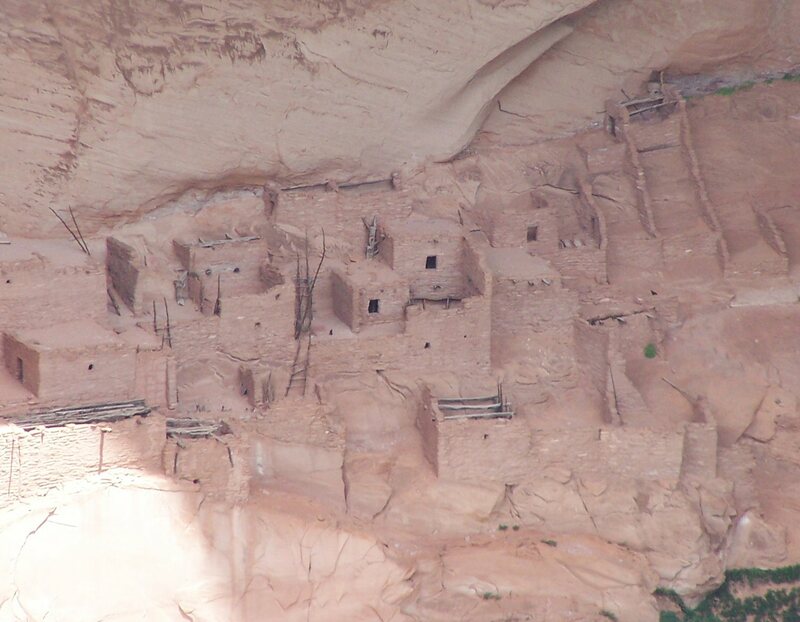 Current Hopi people are believed to be among the descendants of these Puebloans. The villages here are believed to have been stops along the sacred migration paths of at least eight Hopi clans. 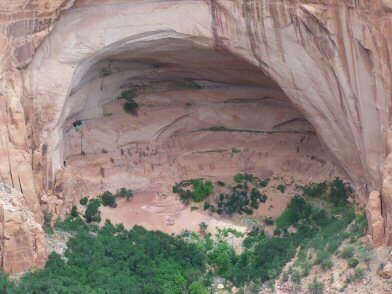 This region of Puebloan Indians is called Kayenta; it is related to, but distinct from, the Mesa Verde area of Colorado and the Chaco Canyon region of New Mexico. The people living here were not always farmers. A thousand years ealier they hunted game. Then, as large animals became scarce, they learned how to farm and use the vegetation available in the area. They became settled and replaced their temparary brush shelters with permanent houses. In time they built clusters of masonry rooms in the protected overhangs by the streams and rivers. There are three sites here: Betatakin, Keet Seel, and Inscription House, all cliff dwellings. Inscription House has been closed to the public because it is too fragile. Betatakin and Keet Seel require lengthy hikes to see up close, and visitors must be accompanied by a guide. There is an overlook for Betatakin not too far from the Visitors Center. People began inhabiting Betatakin around 1250. The cave was attractive because it provided shelter from rain, yet faced south to be warmed by the winter sun. Farmlands were a mile downriver. Keet Seel was occupied much longer than Betatakin. It seems some people were living here by A.D. 950, and was visited in waves of new dwellers. For whatever reason, by 1300 it was also abandoned, though the last residents did leave sealed containers of corn behind, as if they were going to return. Visitors can hike, picnic, and see the ruins. The Visitors center has interpretive exhibits, and is the start to trails and overlooks. There also is an arts and crafts store and bookstore. It's difficult getting a good look at the ruins without taking the lengthy hikes. I didn't have time for the hikes. Story of my life. Betatakin is a five-mile, four-hour hike by guided tour. Bring your own water. Keet Seel is a 17-mile round-trip hike; it is often broken up over two days and also requires a ranger guide. The Monument is surrounded by the Navajo Nation, which is essentially private property. From Flagstaff, go north on Highway 89 for 54 miles. Turn east onto Highway 160 for about 70 miles, and turn north on Highway 564. After about 20 miles, you'll arrive at the Monument Headquarters. From Page, take Highway 90 southeast for 66 miles before it intersects with Highway 160; go northeast for about 15 miles before it intersects with Highway 564. 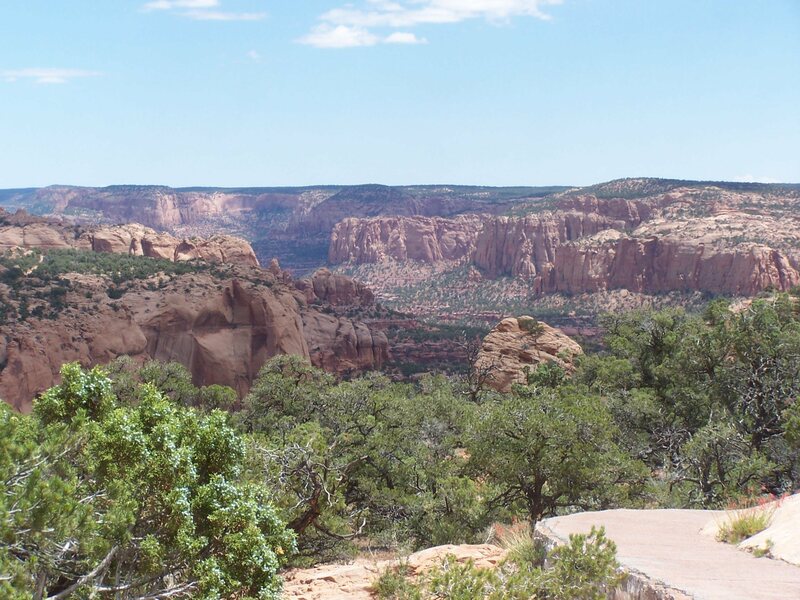 Page and Glen Canyon National Recreation Area are about 100 miles due west; the Grand Canyon National Park is about 140 miles to the west. Canyon de Chelly National Monument is about 110 miles to the southeast. 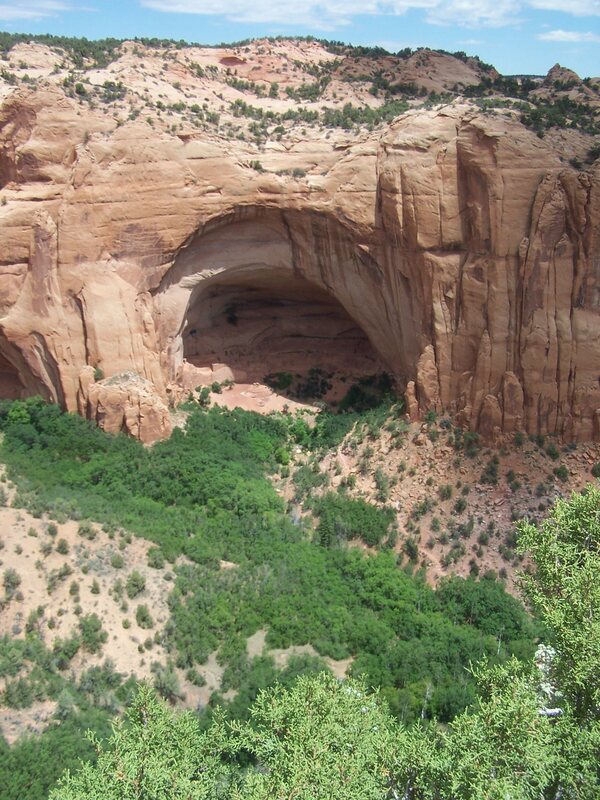 To the north, about 85 miles away, lies Natural Bridges National Monument.